What is the difference between fundraising pledges vs donations? Over $1 billion dollars has been pledged to restore Notre Dame Cathedral. The media coverage has boosted the Cathedral's cause. There's an auction-like atmosphere as each billionaire pledges higher and greater amounts than the last one. Governments have come together to pledge their support as well. How much can be expected to actually be donated? Verbal pledges are loose commitments rather than completed actions. The level of formality of the pledge is to be considered here. Is a billionaire's press announcement of $500 million Euros towards the reconstruction of Notre Dame a firm commitment? Is it a written commitment or even a contract? Can you imagine how complicated this is? A flurry of donor pronouncements and what mechanism and system is in place to keep track of all the information, to confirm it, take details and put forward contracts to make the verbal pledge a real donation offer. I am cautious about these announcements and commitments - they are being made in the moment of the event and receiving world-wide attention so might be overstated in amounts and actual commitment. I went looking for a default rate on things like this, but haven't found anything quotable. What I did find is a U.S. example of how corporations feel about their pledges and donations. Phil Knight, founder of Nike, once announced that he would withdraw a $30 million pledge to his alma mater, the University of Oregon. When Oregon President David Frohnmayer aligned the school with a worker’s rights group critical of Nike’s Asian operation, Knight put his wallet back in his pocket. The $30 million pledge to expand Autzen Stadium was put on hold. The university did not sue. A year later, Oregon ceased its participation and Knight started giving again. 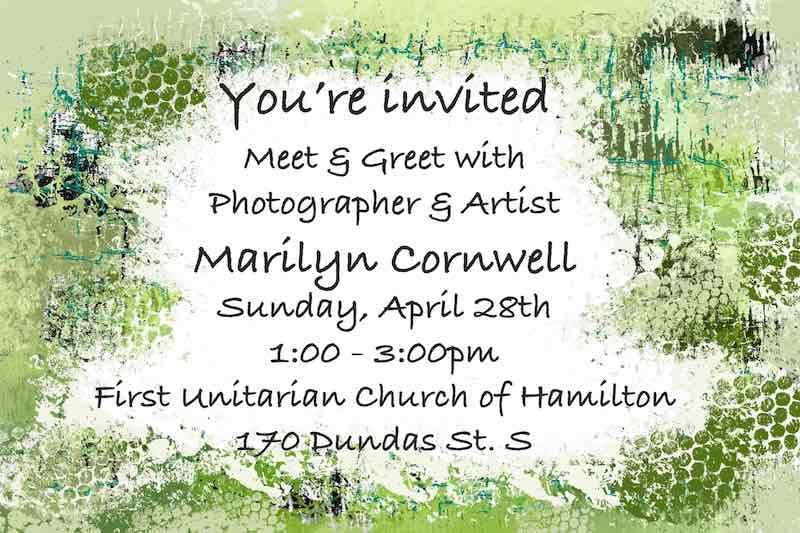 Today's image is an invitation to a meet and greet at Hamilton's First Unitarian Church. There's a show of my work there and this is an invitation to join me on Sunday April 28th to see it. It would be great to see you there.